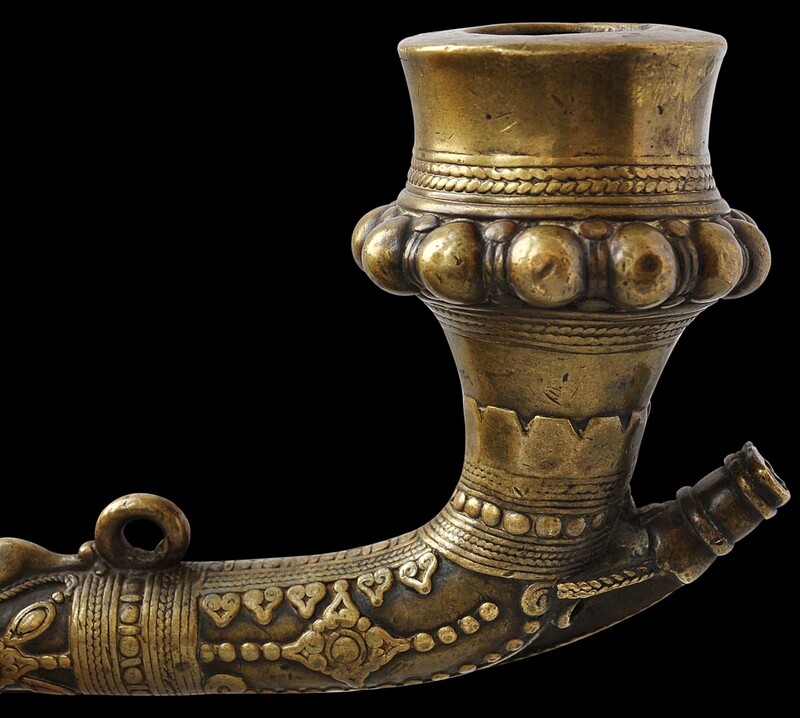 This magnificent and large pipe is an extremely fine example of Batak brass casting. It is in two parts with the tube of the pipe coming apart to reveal a wooden interior that runs part of the way allowing the two parts to press together and stay as one. The head of the pipe is large and well cast with a prominent row of solid cast spheres, which are repeated on the stem, and other cast designs. 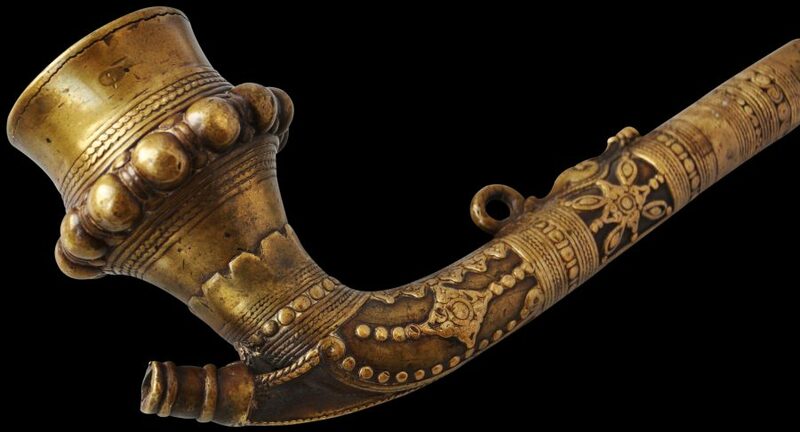 The stem is beautifully cast with typically Batak motifs including a stylised singa (‘lion’) or naga padoha (‘dragon lord of the underworld’) motif. In addition, the pipe has excellent and obvious patina – its contours have been softened by age and handling. Such pipes are so long as to border on the impractical but they were status symbols and part of the insignia of local Batak chieftans (rajas) and datu priests. The Dutch administrators recognised the system of local raja control and incorporated it into their own administrative structures. Each Batak raja was given a white jacket as a sign of their office and a hat with a silver band. Sibeth (1991, p. 169) calls such pipes ‘among the most impressive works of the Toba Batak yellow metal casters.’ The pipes were carried by their owners over the shoulder on heavy cast brass chains. They were smoked by sitting down and placing the bowl of the pipe on the ground in front of the smoker. 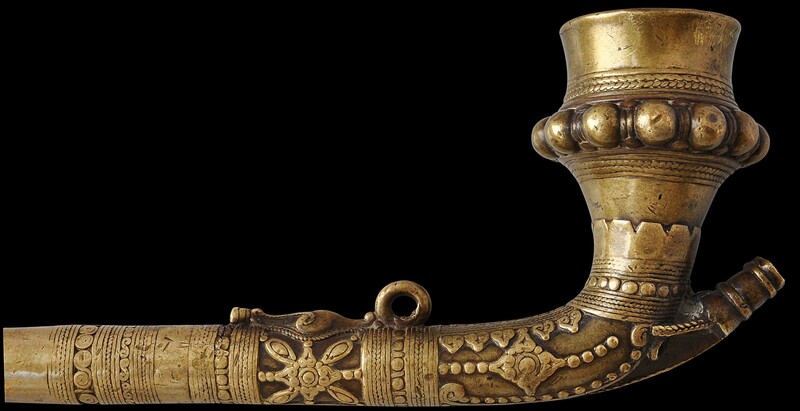 Sibeth (1991, p. 178) shows a small selection of Batak cast brass pipes, most of which are in the Linden Museum in Stuttgart. Each is perhaps a smaller and a less extravagant example than this one. Two others are illustrated in Sibeth (2000, p. 66). 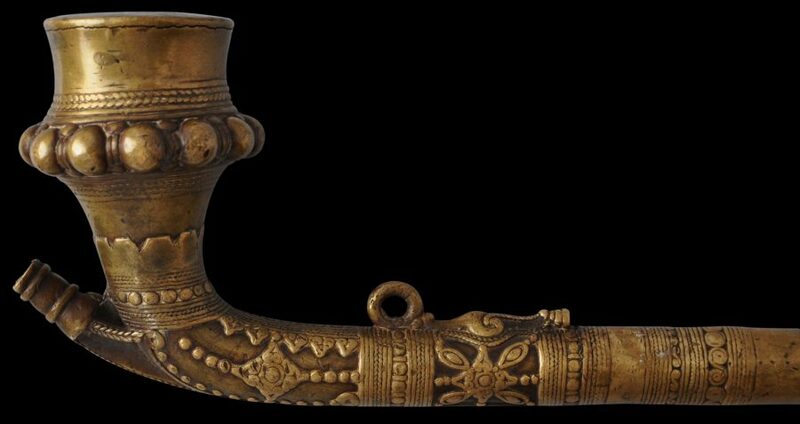 A pipe similar to this example is in the Musée du Quai Branly in Paris and illustrated in ter Keurs et al (2008, p. 23). The Batak are an ethnic group whose ancestral land is in northern Sumatra. Today they number around four million and are one of the larger ethnic minorities in Indonesia. This pipe almost certainly comes from the Batak people who live around Lake Toba in north Sumatra. The lake is the largest freshwater lake in Indonesia and is the centre or Batak culture. Sibeth, A., The Batak: Peoples of the Island of Sumatra, Thames & Hudson, 1991. & Tan, H., Sumatra: Isle of Gold, Asian Civilisations Museum, Singapore, 2010.